Sequential Circuits Inc. Prophet-T8 "A Musician's Work Should Be All Play" full-page colour advertisement from page 13 in the February 1984 issue of Keyboard Magazine. I admit it. I've been kind of avoiding the Prophet-T8. I just never knew what to make of it. I know it was wrong - it was such a HUGE beast of a synthesizer, it deserved more of my attention. So when I flipped back to early 1984 issues of Keyboard Magazine to find this ad, I was a little surprised that the ad-space iwas shared with both the Prophet-600 and a Commodore-64. I guess it kinda makes sense. 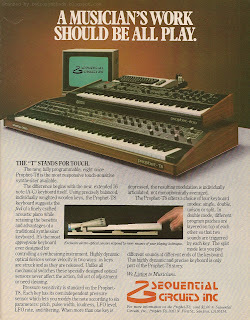 The introductory Prophet-600 two-page advertisement had been running for months before this ad appeared. And SCI's MIDI interface/cartridge for the Commodore 64 had also just recently been announced. But the Prophet-T8 was SCI's new flagship synth - a $6000 MIDI-fied polyphonic powerhouse ready to take on the world. Yet it gets just a page of ad-space. And has to share it with two other products as well. Even more odd though is that although the main photo in the ad includes both the 600 synth and Model 64 sequencer, neither is mentioned in the actual ad-copy. They are just props. Again - makes a bit of sense since they were both recently announced. But I still would have expected the Prophet-T8 to get some solo time before having to share space with others. Also, interestingly, the month that this introductory T8 advertisement began it's three month run in the February 1984 issue, the magazine also began to run that two-page introductory advertisement for the Six-Trak, Drumtraks and Model 64. No kidding! All in the same issue. So, why not just include the Six-Trak and Drumtraks in the T8/Prophet-600/Commodore photo as well since they were all available at the same time? Make a family occasion out of the whole thing? I'm thinking that is because SCI was trying to promote the Six-Trak/Drumtraks/Model 64 as part of the "Traks Music System" - geared towards the musician that couldn't afford the Prophet-T8. Two totally different markets. Two totally different ads. Even though the Prophet-T8 ad began appearing at the same time as the Six-Trak/Drumtrak/Model 64 ad, the T8 actually first appeared in Keyboard Magazine much earlier. In the timeline of things, the Prophet-T8 was actually the second SCI keyboard with MIDI to appear in Keyboard Magazine after the Prophet-600. The Prophet-T8's first appearance in Keyboard was four months earlier in the Spec Sheet section of the October 1983 issue. It's one heck of a Spec Sheet too - because it's one heck of a machine! The promo focuses on the T8's best qualities - the keyboard itself and it's modulation section. "SCI Synthesizer. The T-8 is a touch-sensitive 8-voice polyphonic synthesizer from Sequential Circuits. It has a 76-note keyboard (A to C) that is both velocity- and pressure-sensitive. the keyboard is built of wood and has a weighted action. Velocity sensitively is adjustable and has been incorporated in the ADSRs, which give you touch control of each parameter of teh ADSR. Release time can be controlled by the velocity that the key is let up with. A poly-mod section provides additional flexibility by routing the velocity-controlled envelopes to other destination such as the oscillator frequency or pulse width. Each key as an independent pressure sensor. This second touch can be used to control the frequency of oscillator banks A and B, the pulse width of oscillator banks A and B, the filter, amplifier, LFO amount, and LFO frequency. The unit's eight voices (two oscillators per voice) are assigned according to four different keyboard modes: single mode, which sounds eight voices across the entire keyboard; double mode, which blends two different programs into four voices; split mode, which divides the keyboard and allocates four voices to each side of the programmable split point; and unison/track, which combines up to eight voices on one note (these voices may be either the same pitch or arranged in a chord composed of up to eight voices). A built-in real-time sequencer is provided with a memory capacity of over 600 notes. The sequencer also remembers all velocity information. The unit also includes a new envelope mode called ADR that sets the sustain to zero for creating more natural percussive envelopes. Both ADSRs have two programmed release settings. the second release is selected with either the second release switch or the release footswitch. the mod wheel can be programmed for an initial setting with the initial amount control. The unit weighs less than 60lbs. Price is $5,995.00. Sequential Circuits, 3051N. First St., San Jose, CA 95134." Wow - that was a mouthful! One of the main reasons I like that Spec Sheet promo is that it explains the reason behind the ADR envelope mode - more realistic percussion. I like it anytime I can get insight into the "why" of an included function, not just what the function does.